Communication skills expert Nancy Mueller helps professionals polish their personal brand to transform business relationships and achieve leadership success. As Founder and President of International Adaptations, she has spoken to Fortune 500 companies, professional associations, corporate and educational conferences, and state and federal government. Her clients are among the top performing companies in their respective fields, including Deloitte & Touche, KMPG, Peterson Sullivan, Berntson Porter & Company, The Boeing Company, Sparling, Franklin Templeton, IBM, Coca-Cola Enterprises and Weyerhaeuser. Her presentation topics include: business etiquette, civility and manners, communication skills, and cross-cultural savvy. 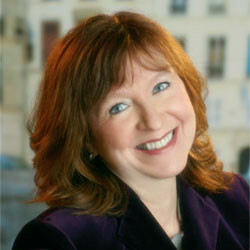 An avid world traveler, Nancy’s international experience includes directing an educational cultural exchange organization in the Pacific Northwest, teaching in Egypt, presenting communication workshops in Canada and throughout the United States, consulting in Europe and traveling in Brazil, Ecuador and the Galapagos Islands, Europe, Hong Kong and Mainland China. She earned her master’s degree from the University of Washington where she studied English, French and Russian. Specific action steps to help readers achieve their global career goals as quickly and easily as possible. Nancy offers advice and opinions about communication, relationships and leadership. Business etiquette, civility and manners, communication skills, and cross-cultural savvy. Nancy’s clients are among the top performing companies in their respective fields. "Thank you for a spectacular workshop. Nancy enlivened us with a great blend of information, insight and encouragement. I came home elated and ready to dive in." "Nancy’s ‘Executive Presence’ seminar was very well-received and the post-course evaluations were strong. Nancy was a pleasure to work with and tailored the course to fit our needs."